You can’t have a global fraud conference without top-notch keynote speakers, and we don’t mean to brag, but this year’s lineup is incredible. The 30th Annual ACFE Global Fraud Conference will bring you experts from all over the world so you can hear their stories, learn practical skills and return to the office with strategies to help you stand up against fraud and stand out from your peers. But don’t take our word for it. This year’s speakers have shown up in some of the biggest, most world-renowned news outlets. Here are some recent highlights. Alexandra Wrage, former member of the FIFA Independent Governance Committee will join body language expert Cliff Lansley, convicted fraudster* Roomy Khan and others as speakers at the 2018 ACFE Fraud Conference Middle East. Carolyn W. Colvin, Acting Commissioner of the Social Security Administration (SSA), has officially joined the keynote lineup at the 26th Annual ACFE Global Fraud Conference. She will speak on Tuesday, June 16 at the 8:30 a.m. General Session in Exhibit Hall CD. 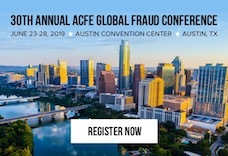 May 12, 2015 / Donn LeVie Jr.
One of the most valuable offerings for Annual ACFE Global Fraud Conference attendees is access to the onsite career strategists as well as employer representatives in the Career Connection. These professionals have decades of experience understanding what hiring managers are looking for in candidates to fill open positions and provide onsite personal consultations for conference attendees in several key areas: cover letter and résumé reviews, LinkedIn profile reviews, interview tips, professional brand development, and ways to promote expertise through social media. One of the aspects of the ACFE Global Fraud Conference that I most enjoy are the personal relationships that I have developed over the years. Talking shop and learning from the work experiences of your colleagues is one thing. But actually getting to socialize with them over a cold beverage is a great way to make connections and build lasting bonds. The Maryland Chapter is thrilled that the 26th Annual ACFE Global Fraud Conference is being held in Baltimore this June. We are proud and excited to show off Baltimore’s charm and beauty to three -thousand members of the ACFE from around the world. Maximize your training opportunity at the 26th Annual ACFE Global Fraud Conference with optional Pre-Conference and Post-Conference sessions. These sessions offer an opportunity for more in-depth learning on focused areas as well as additional CPE credit.